Mountain Home School District in Mountain Home, Arkansas, has chosen to replace its existing school nutrition solution Meal Tracker with eTrition, a cloud-based solution from Harris School Solutions. 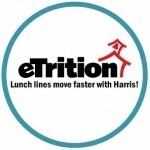 Harris, the leading provider of K-12 child nutrition accountability solutions, has over 100 school districts using eTrition. The search for a cloud-based system that is easy to learn led the district to eTrition. Mountain Home is eager to take advantage of the efficiencies of having its data accessible in the cloud, while eliminating the burden of requiring users to work only on specific computers with traditional client software installed. eTrition’s cloud solution will also relieve the district of the burden of maintaining servers and managing sensitive data and backup routines. Mountain Home School District is making plans now to go live on their new system to coincide with the 2016-2017 back to school season.